Frazier Mountain from an unnamed ridge. Hungry Valley and mostly beyond from Bear Mountain. 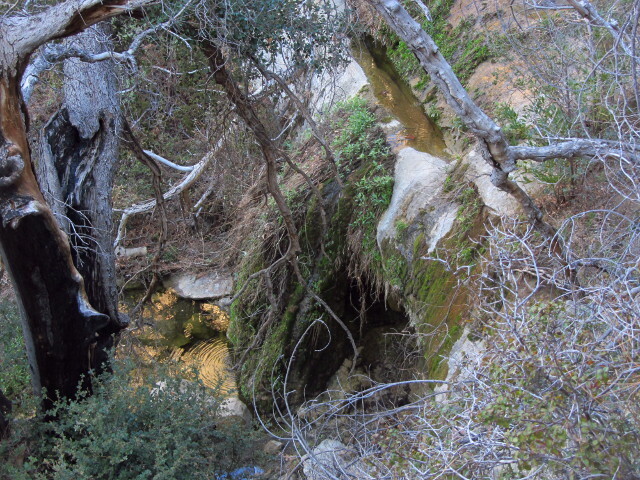 A few rocks at a creek crossing coming down from Manzana Narrows. We hit the road not quite as early as planned for the Mill Creek Trailhead off the Old Kern Road with the goal of Breckenridge Mountain, about 11.5 miles and 5000 feet up. The weather was predicted to be rain overnight, with particularly high probability in the very early morning hours, but "30% before 11AM" for our purposes. There is a descent drenching over the Grapevine, but by the time we are at the trailhead, skies are showing brief patches of blue. Just under the slowly lifting clouds to the north, the mountains have been topped with a layer of white. 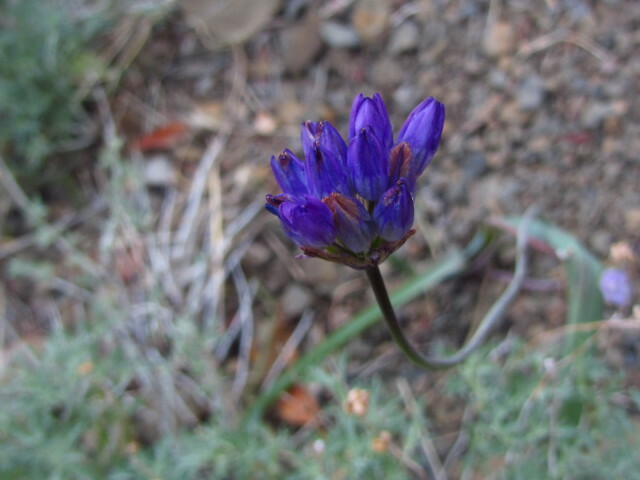 At our feet, small wildflowers are blooming dotting the area with purples, whites, and yellows. The trail initially undulates along, crossing the creek from time to time. As we hit the creek, reds are added to the wildflowers and we spot our first salamander of the day. The start of Mill Creek Trail at 2400 feet. The correct trail winds upward at a better grade to the left. Looking across the road, the south slope is showing the result of the rain last night at higher elevations. A look up the valley to another very linear snow line as the clouds are lifting. (Day 3 of 3) Camp is much more full this morning and it is just volunteers now. Our only task is to carry the tools back down and get ourselves back safely. We are all a little slow after our big dinner. I guess I did not mention the big dinner. There was fire roasted bits of bread dipped in melted butter and given a bit of garlic salt and it dissolved into deliciousness in the mouth (and left plenty of residue on the hands). The meat eaters had a bit of mammal flesh, too. Beans and salad and beer rounded it all out. None of us lasted past 9PM, just like the night before, so perhaps we are not all that rowdy after all. We are not all that much slower and Mike is wanting to get an early start with the goats since Gunter started to get very slow the day before. Coming up, Nitro took his pack the last 2 miles. They are both about the same age. The rest drift one by one from camp, grabbing tools as they go. Folks seem more enthusiastic about carrying the weight down than they were about up, and there are none left for the last few to leave. 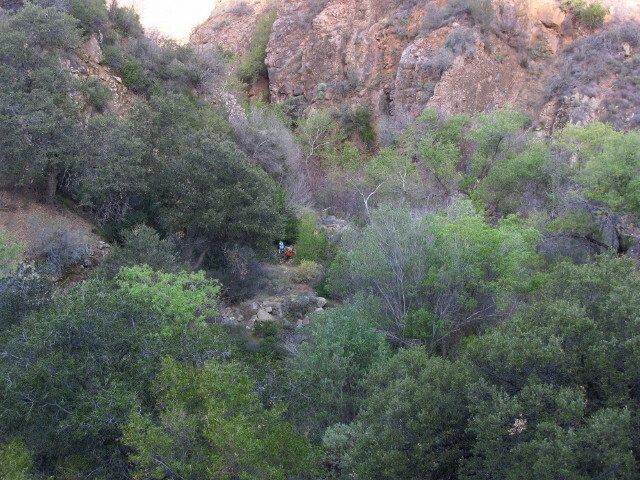 Mike and goats vanishing into the bottom of a narrow section of canyon. Most the blue dicks out are quite small, but there is one above Manzana that is particularly blue and large. Although not many of each, there must be a half dozen types of purple flowers along the trail. (Day 2 of 3) Manzana Narrows is shadowed but light in the morning. The goats are feeling more comfortable and decided to spread out around the campground foraging for breakfast. One takes a few sniffs at my pack and then my drink tube, but then leaves it alone opting for a bit of bay laurel instead. We split into two groups, one to head up Big Cone Spruce and one to start toward White Ledge and divvy up the tools. 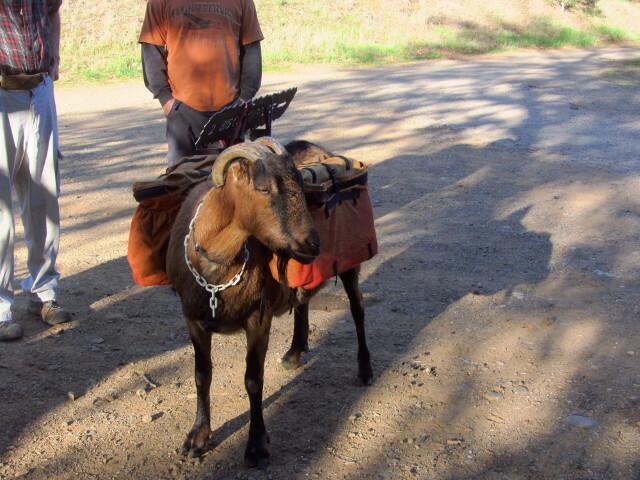 The goats are taking the low side where they will hopefully eat up the poison oak and I am headed up the hill. 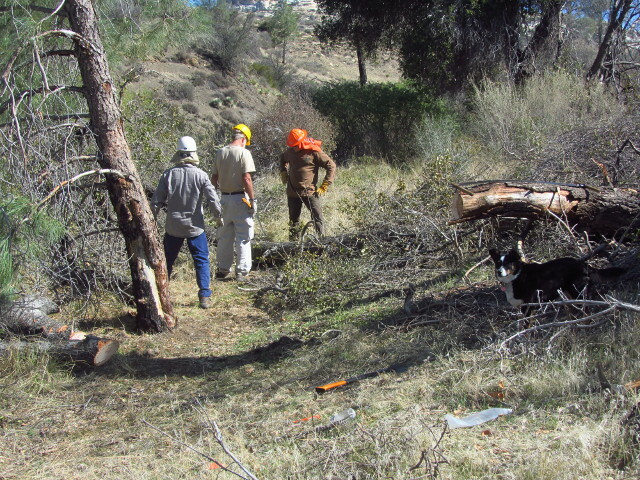 Another crew from those in Happy Hunting Ground will be getting a large tree at the top of the trail, but we will go after everything we find after that. We are loud as we get going, but the couple we are sharing the site with do not stir until we are headed out. It is already getting toward warm for hiking as we head up the hill. The water is flowing better at the top as well and some of the dry waterfalls are now flowing. The big tree at the top is one with a heavy trail climbing the slope to get around, but I went under when day hiking. I do not remember it being particularly thick, but the 6 foot saw is comical as the group work on it. Only short strokes can be made. We take the use trail up and over since going under wouldn't be safe while people are sawing. Our first tree is an oak that fell in the rain judging by the still green leaves. The wood is wet and dense, but we eventually get through it only to find we need to slice that in half to move it. 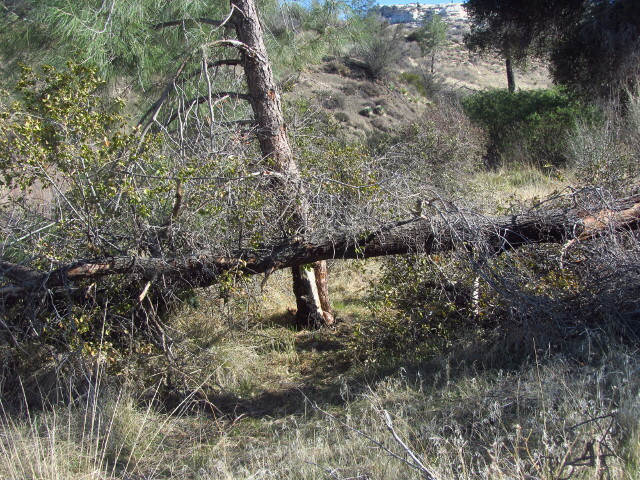 The first tree is a solid old oak that has fallen across the trail recently. The light weight 4 foot saw is a little different than the one I used before. Once done with the first trunk, there seems to be a larger one behind it. This tree had a forked trunk. A number of large branches behind this trunk also had to be removed, but that is already done. (Day 1 of 3) It seems to be the season for trail work. 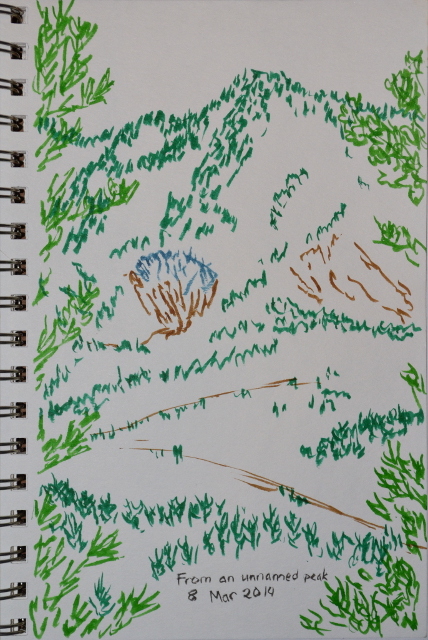 The original plan for this one was to head up Lost Valley and cut out a few of the baker's dozen (plus whatever the rain brought down) trees and make the tread somewhat less scary at the top. Having just come down the trail, I figured the need was great and I was in. Unfortunately, rumor is the post-rain water situation is very much like the pre-rain water situation, and the only water near the unofficial "Twin Oaks" camp is a mile up at the spring or a mile down and stagnant. 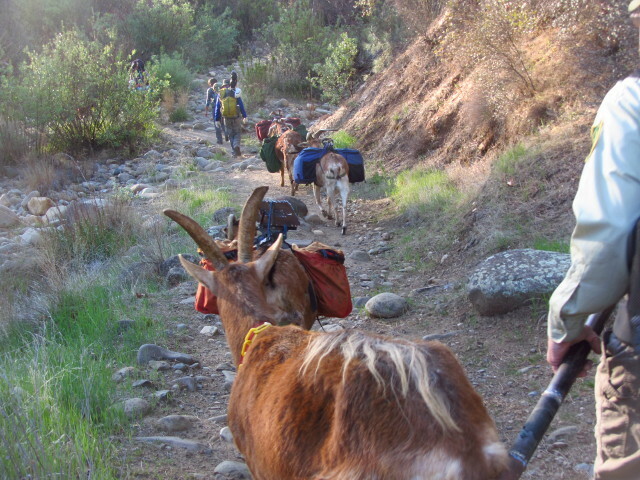 This can be fine for a bunch of hard working humans who will have one or two in their number who will be willing to bring down water, but this is a Mike Smith trip and is supported by a collection of pack goats which complicates the situation. The people would rather have water closer at hand, too. We have been diverted to the Manzana instead, where the water is now flowing all the way to NIRA and added a couple signs to plant. It all needs doing. One of the goats (Rufus?) packed up and ready to go. He is carrying the new Big Cone Spruce sign. Hard hats and tools are passed out to the volunteers with the usual signatures and talk to go with it. Some of the group will be heading up to Happy Hunting Ground for the night, then will get all the way to South Fork and start working back. The bulk of the group will head up to Manzana Narrows where everyone will gather for the second night. The morning is misty as we head up the creek. The goats and the volunteers are loaded up and headed out. Nitro, at the back, is feeling his years, so isn't carrying anything. He might have had to stay home, but you cannot leave a herd animal used to a herd home alone. Mike has the other sign. I have a list of potential hikes that seems to add items faster than they get done, and many hikes I do do not even come from this list, so when Bernard said, "We should have another 20 mile hike," I jumped at the chance to check the item "Old Man Mountain" off of it. Then I remembered him mentioning that he was not a fan of fire roads and tried to backtrack on this suggestion because this route is almost entirely on fire roads. It was too late, the suggestion was made, it was declared that a fire road might be alright once. The Matilija Trailhead has cars stacked in everywhere, but not so many as I expected and it is easy to find a spot. This area got almost 18 inches of rain by one gauge, so maybe people are worried the creek is still uncrossable. Online USGS stream gauges include one below the dam which indicates water flow is already below normal for this time of year. It is an illustration of the need for a long, soaking rain before the big storms to get as much as we can out of them. I was worried that with the road closed preventing access to popular areas, everyone might be coming here. Luckily, I am also wrong, or at least not yet correct. Still somewhat early, but not too terribly early, on the gated part of Matilija Canyon Road. For once, there is no watering going on along the first ranch. We admire the peacocks and the fat geese as we walk past their cage. The two creek crossings are easy, but delightfully full. We are feeling the slightest bit of warmth of the day as we come to the Murietta Canyon Trail and duck down it under the trees. The trail seems to have suffered nothing in the heavy rain of the last storm, but a much older oak fall forces a sudden divergence from the set route. The camp is empty when we arrive, which is also unexpected. Before long, we climb back out of the trees and onto the road again. 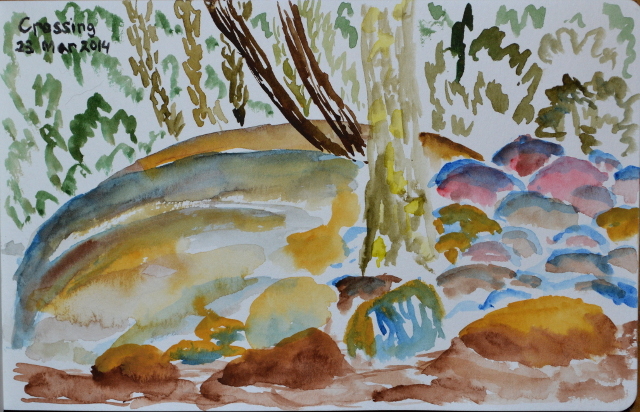 The climb under oaks and past a stream that dives underground as it hits the road is rather pleasant. As we come to the flow from the spring toward the top, the sound of water and birds grows louder. 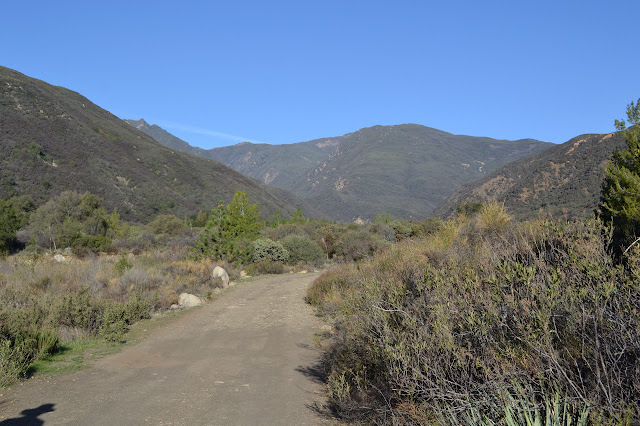 It is a very pleasant climb to the divide between the Santa Ynez and Ventura River watersheds. 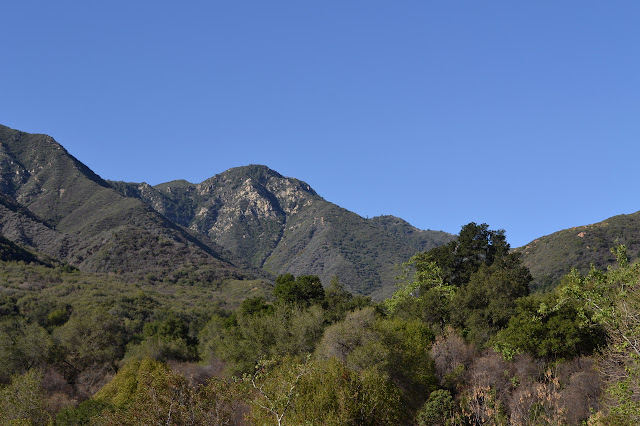 The rocky peak that is the highest point in the Santa Ynez Mountains rises above Murietta Canyon. At the saddle, we turn north along Monte Arido Fireroad and climb the divide. 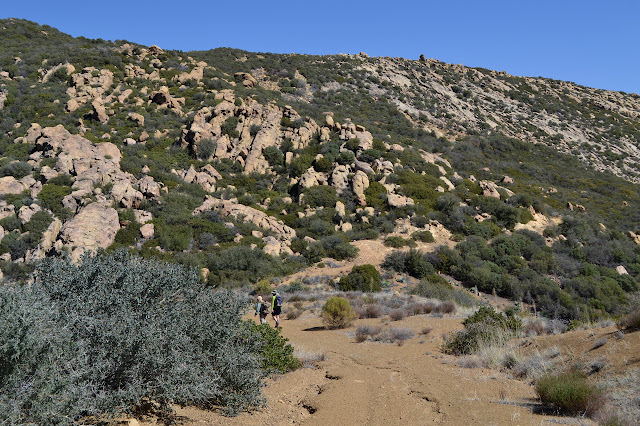 The climb is quickly broken with a drop past a small lake behind the earthen Murietta Dam. Climbing again, Garth notes that it is already 87°F according to his watch. The rest of us disagree that it could be that hot already, maybe partly out of wishful thinking, and he hooks the watch so that he is not heating it up himself, but it refuses to read lower. A multitude of breezes off the ocean help to keep us cool as the sun tries to heat us on the south slope climbs. It is quickly apparent that visibility is somewhat limited by moisture haze. 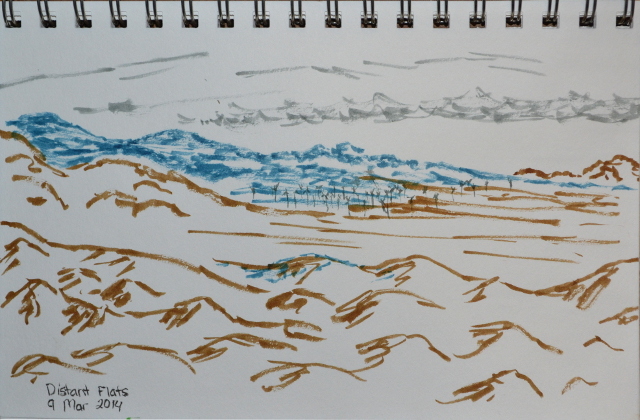 Garth and Bernard check out the Santa Ynez basin and a little bit of water. 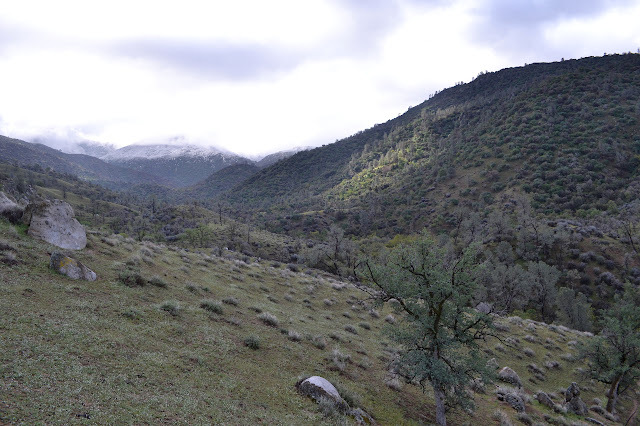 After Gold Hill Guard Station, Gold Hill Camp, and Gold Hill OHV Trail, maybe I should actually hike Gold Hill. 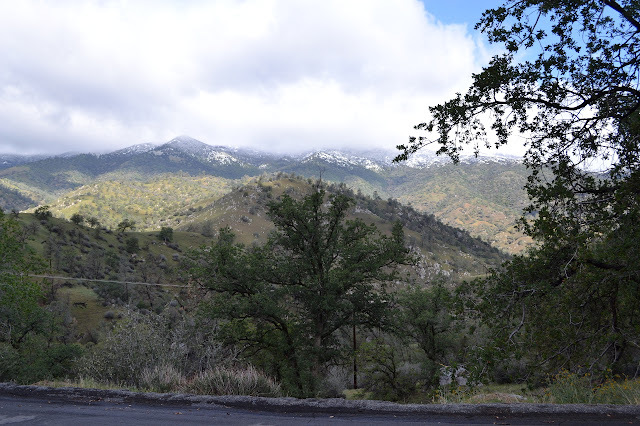 The peak is near to Snowy Creek OHV Trail and even nearer to an old track used by prospectors, part of which makes up a portion of the trail. To judge by the map, Gold Hill was ultimately a bust, but people tried really hard to make it work and put a lot of holes in it. There is another high gate to climb over to get onto Snowy Creek OHV Trail, which is not so hard to find after all. Just hang a right just before the biffy in Kings Camp and it is at the end of this spur of the camp on the far right. There are lots of footprints on the trail for the first half mile, but then most of them seem to turn back at a dry creek crossing before any substantial climbing. It does not take much climbing to get some views, which is good since there is not much to climb. A few low hills off to the north. The old guard station is behind stuff to the left and the use trail may go there. 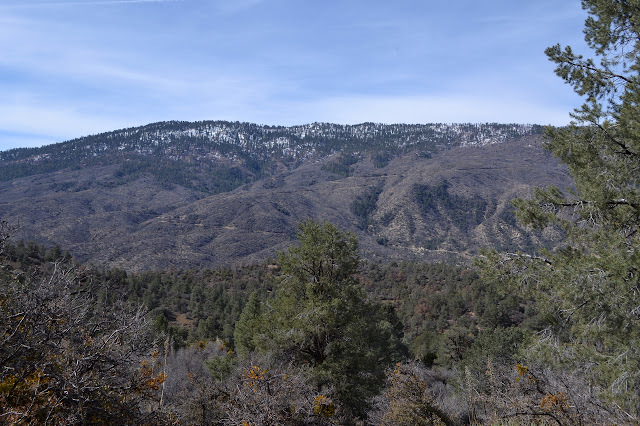 Behind, part of the ridge I climbed yesterday and Frazier Mountain. Alamo Mountain got some snow in the last storm, but it is already looking thin on the north side and vanished from the south. 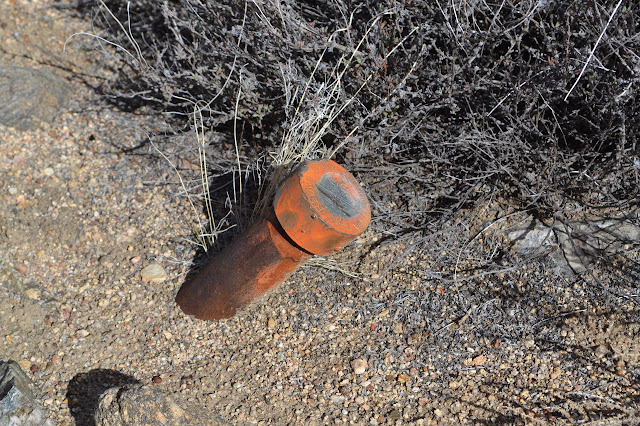 I signed up for another round of cleaning up microtrash at the former Gold Hill Guard Station with Los Padres ForestWatch, so head out to the site, but this time with a plan to fill in a few of the extra hours in the day since the cleaning is only from 9AM to 3PM. There is getting to be more hours of daylight, so there are plenty before and after. There's no real plan for before, but the plan is to find monuments and it is piecemeal. Waking up an hour early makes it make sense to do part before. The first piece is a boundary monument where the boundary makes a corner, so I pull over to the side beside the forest gate. This is actually already in the forest as the post is to the north and I passed the line when passing south of it. I head north along a road marked green and I could probably drive, but there is little point since it is only a quarter of a mile. 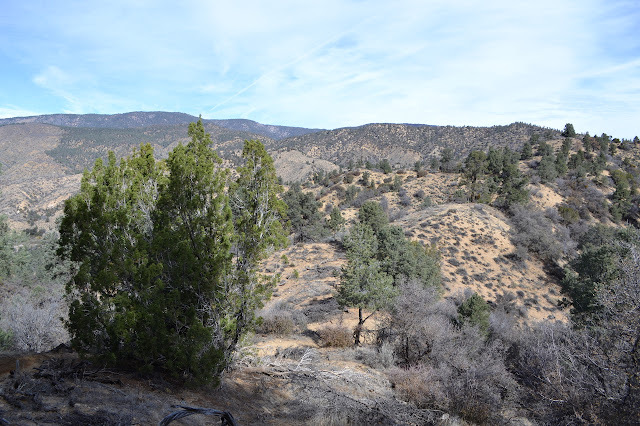 A bit short of a creek, it is time to start looking for the monument west of the road. It is easy to find as there is a fat post next to it. Well, what is left of a fat post is next to what is left of the monument. It looks like someone took a hack saw to it and took it home. 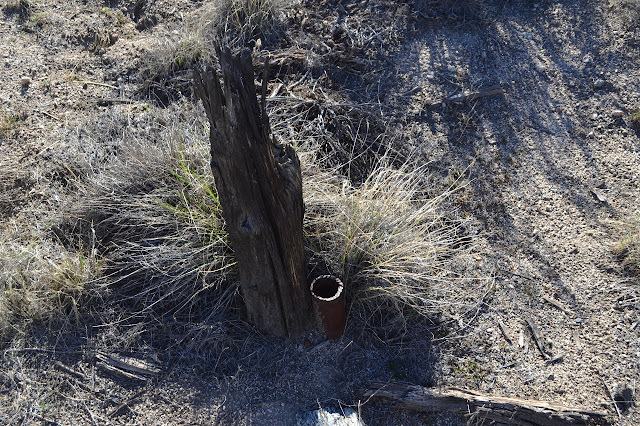 A cut off pipe that was probably once the boundary monument at this corner of the forest. There is another post just after the ford on Dry Creek, but this is a section of private inholding, so skip that and arrive at the guard station site to join the other volunteers for the work. It looks a lot better than when we started before. There are a lot of the same faces and a couple new ones this time. After a while, we move over to another area along the side of the spur to Kings Camp. (That is written up here.) When finished, a few of us continue to Kings Camp for the evening. 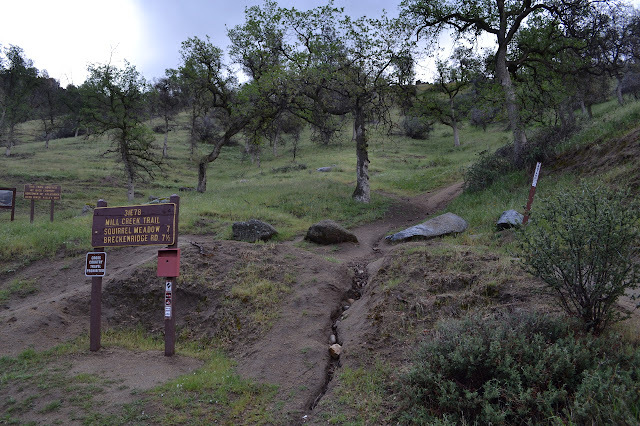 I have two more monuments to find and head over to the Piru Creek OHV Trail by Gold Hill Camp. The trail is closed to motorcycles currently, so there is a high bar to step over. This one wanders past a monument just north of the camp. It is also easy to find, marked by a couple slapsticks faded to and pink labeled "property boundary". The monument between them has been disturbed, to say the least, resulting in major divots and tilting at a 45° angle. Severely bruised and looking nearly broken, but the survey marker is still here. Set by Ventura County in 1960.